KATHMANDU, April 17: Ang Rita Sherpa, a guide who scaled Mt Everest 10 times without oxygen, has been hospitalized and is under medication, said an official. Sherpa, 68, is undergoing treatment at Basbari-based Neuro Hospital after a brain hemorrhage. “According to doctors involved in his treatment, he may have to undergo operation if the medication does not work,” said Thakur Raj Pande, general secretary of Nepal Mountaineering Association. Pande said Sherpa has been shifted to general ward after ICU treatment. “We are doing our best for his treatment,” added Pande. 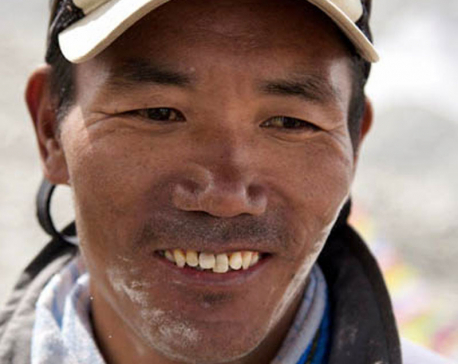 Sherpa scaled Mt Everest 10 times between 1983 and 1996 but stopped climbing after developing health related problems. He has had lung and kidney problems in recent years. Minister for Tourism, Culture Civil Aviation Dil Nath Giri and officials visited Sherpa at the hospital and expressed commitment to help in his treatment, said Pande. Sherpa's daughter Dolma Lhamu Sherpa is attending on him.